In my previous post I summarized the notation for Flow-Design (FD) diagrams. Now is the time to show you how to translate those diagrams into code. Hopefully you feel how different this is from UML. UML leaves you alone with your sequence diagram or component diagram or activity diagram. They leave it to you how to translate your elaborate design into code. 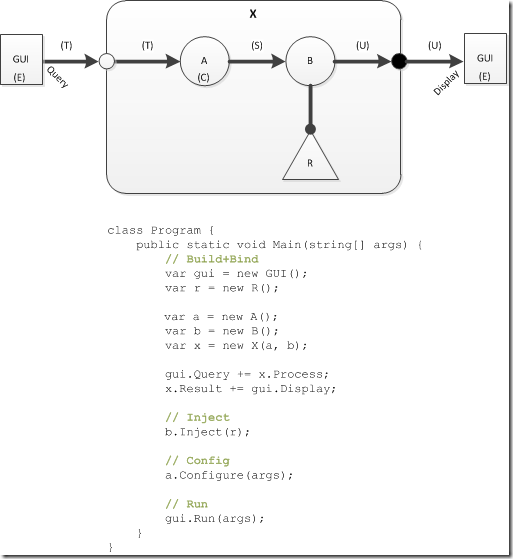 Or maybe UML thinks it´s so easy no further explanations are needed? I don´t know. I just know that, as soon as people stop designing with UML and start coding, things end up to be very different from the design. And that´s bad. That degrades graphical designs to just time waste on paper (or some designer). I even believe that´s the reason why most programmers view textual source code as the only and single source of truth. Design and code usually do not match. The first translation I want to show you is for small designs. When you start using FD you should translate your diagrams like this. In any case be sure to keep the board method clear of any and all business logic. It should not contain any control structures like if, switch, or a loop. Boards do just one thing: calling nested functional units in proper sequence. But as I said, this simple translation is for simple designs only. All pretty straightforward, isn´t it. But what about wires, named pins, entry points, explicit dependencies? I suggest you don´t use this kind of translation when your designs need these features. Translating to methods is for small scale designs like you might do once you´re working on the implementation of a part of a larger design. Or maybe for a code kata you´re doing in your local coding dojo. Instead of doing TDD try doing FD and translate your design into methods. You´ll see that way it´s much easier to work collaboratively on designs, remember them more easily, keep them clean, and lessen the need for refactoring. Translating FD diagrams to methods does not scale well. To reap all the benefits of FD you should therefore translate designs to Event-Based Components (EBC) as they were called originally. However this term is now deprecated, since the translation does not produce components in the sense of binary units of code. Nevertheless events enter the stage to hook together functional units. The default names for input-pins and output-pins are Process() and Result. You might find that strange since you´re thinking of classes as “things” with many responsibilities. In FD, though, classes can be very small with just one responsibility. And this responsibility is an action. It´s not unusual to have a functional unit called “Read lines from text file” which then is translated into a class; why then should the class have a methode called ReadLinesFromTextFile()? Process() is sufficient. Boards and parts do not differ in their basic translation. Both become classes (or interfaces, if you like). However, parts you implement yourself in some creative way. They are the workhorses. They contain the domain logic. Boards on the other hand could be generated – or are implemented by you without much thinking. Leave aside any creativity when implementing boards. With FD dependencies are (primarily) used to express nesting, i.e. different levels of abstraction. So a board is dependent on its nested functional units. Within a flow, however, functional units do not (!) depend on one another. FU A does not depend on FU B or vice versa. Also X is independent of any other FUs preceding or following it. That makes testing extremely easy (see below). A join unfortunately is not that simple. You should create a small standard part to accomplish the task – or you use the join class from the ebclang project at CodePlex. ebclang is an effort to provide tools to help with Flow-Design. And ebcpatterns is a sub-project collecting implementations of parts to solve recurring problems. One word or many… that does not make a difference for the translation of the output-pin to event Action<string>. But there is a difficulty for any receiver of the output packets. Which word is the last word in a line? If several lines are processed and if it makes a difference to which line a word belongs, then a receiver has no way of associating a word with a line. The only way would be to send a special End-of-Line word as the last word of every line. The star after the typename signifies the packet to be a list of data items. And a list is most simply represented by an IEmumerable<>. Please note: This also works if the list contains millions of entries. Just don´t create an array and pass it along, but use an iterator (yield return) instead. Injection does not interfere with any other part of the implementation. It does not force a ctor or an additional parameter to the ctor, it does not require a base class. 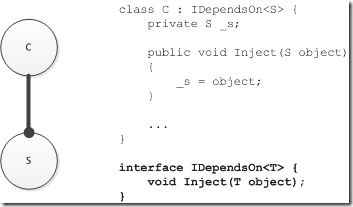 Injection is independent of object creation; injection can take place at any time during start-up of a Flow-Oriented application. With board you just do integration tests. Check only if the wiring is correct. Every path through a flow needs to be tested only once. Once you start using tools to generate boards these integration tests are not needed anymore. You need to assign any relevant output event handlers before you call an input-pin method of the part. And don´t do the assert in the event handler because the test would go green even if the handler is not called. Build and Bind are put in a sequence to distinguish them; in reality, though, they are intertwined since binding happends also in ctors of boards upon creation. You write "Translating FD diagrams to methods does not scale well." and then suggest using a synchronous event based mechanism instead. I don't understand that. Could you please elaborate a bit more on what does not scale well with methods in the synchronous case? Why do I need synchronous events? Couldn't I just make 1 class with a single Process() method for every functional unit (circle in your diagrams)? Wouldn't that be simpler? Using methods for the functional units (circles) is just fine. Use them whenever you can - but be aware that some functional units are not so easy to translate to methods. Then switch to classes. Example: A functional unit with several inputs which can be used independently. So the most general translation is to Event-Based Components (EBC) as shown in this article, where procedures represent input ports, and events represent output ports. Please note: Neglecting that it´s not easy to return multiple results in many languages like you suggested (except by using special types), your approach does not solve the problem of outputing several data items via an output port (streamed output). Maybe my pseudocode with returning tuples and destructuring multiple assignment was not so clear. How about the following (now compilable Java)? Wouldn't that be easier? With streamed output you mean results of the functional units being delivered not completely but incrementally, something like listenable collections where you get notified every time a new element of a result collection arrives? Is that a very relevant use case in today's business applications? "Streams" are very relevant. You want them at your disposal, even though it´s not the main way to output data. Events are not an important language feature. But function pointers of some kind. Otherwise its hard to implement the observer pattern - because that´s what´s needed for "anonymous" outputs. A function result outputs data anonymously. The function does not know where its output is going. But you don´t want to be limited to functions to translate functional units into. This kind of anonymous output is one of the most important aspects of flow-design. Use whatever means your language offers you. I have been programming enterprise web applications in Java for more than 10 years and never came in contact with streams. And I have seen a lot of them. I would say for most web applications that is irrelevant. And I think the majority of programmers out there are building similar web applications without streams. No need for them to use events because they just don't need streaming. I would add that event complexity later only when I need it and where I need it. No need to carry that additional complexity around with me all the time IMHO. AFAIK streams are really interesting in the Big Data area. But there are different approaches there and streams between processes running on different cores (similar to FBP) only being one of them for distributing computation across multiple cores. AFAIK other approaches exist in that area, too. "Streams of data" are interesting for three reasons: 1. when there´s lot´s of data, 2. when consumption of output should start before its generation has finished, 3. when generation is dependent on feedback from downstream (which is a special case of 2.). I don´t want to judge who, where, when these cases are relevant. I´m just saying, they exist and need to be dealt with. That´s why functions with a single result as a way to translate functional units are not enough. Events/continuations are an important means to encode flows. I would not want to use a language making it difficult to implement them. That doesn´t mean you can´t do flow-design for Java. Here´s a blog devoted to that: http://blog.jebc.de/ (German). In any case events or not: that´s implementation detail. What´s more important are principles. To me that´s the Integration Operation Segregation Principle (IOSP): A functional unit either integrates other functional units to a larger whole (Integration) or it is an Operation. Operations contain control structures and expressions, Integrations do not. Integrations depend on other functional units, Operations do not. To me violating this principle is the cause for much entanglement in today´s code bases. Logic (control structure and expressions) are smeared all over the place, vertically and horizontally in the common class/object hierarchies. As you said it: putting behavior back at the core of software systems is the purpose behind flow-design. Behavior over data (or functionality over class) - to counter balance the wide spread approach to software design starting with hunting for (candidate) classes. Assuming that the dependency of an adapter is mandatory, why do you favour setter (method injection by means of IDependsOn) over constructor injection? Using constructor injection expresses that the dependency is mandatory. So what is most important reason to not use it? Can you clarify this, please? Thanks. * Injection does not interfere with any other part of the implementation. It does not force a ctor or an additional parameter to the ctor, it does not require a base class. * Injection is independent of object creation; injection can take place at any time during start-up of a Flow-Oriented application." But then... I wrote this quite a few years ago :-) Today I´d use ctor injection, too, most of the times. It´s more lightweight and serves the purpose. However, there are times when I want to be more explicit and clearly separate a configuration phase with regard to the flow from a construction/build phase. Then I use setter injection. Java 8 introduce the Stream API. It's a straight forward flow with filtering, mapping and so on. But without branches. I create a playground to learn more about flow design. I implement the event based approach with functional interfaces, used as lambda or method reference. Dependencies and Configuration aren't interface. I use annotations, so a dependency injection container can be used.